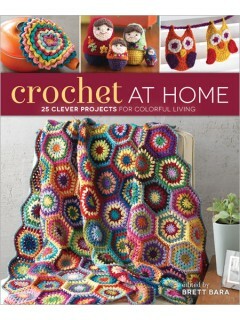 Crochet at Home, edited by Brett Bara, contains 25 projects for the home. Included are colorful projects for the living room, bedroom, and kitchen. The projects are all designed by various designers and include some of my favorites and probably a few of your’s as well. Each project contains a list of materials and notions, gauge, sizes, stitch guide, tips on choosing colors, written instructions, symbol charts as needed, and photos. The end of the book provides a listing of abbreviations, a stitch guide, and a resource listing. The first section is for the living room and includes patterns for a blanket, pillow, ottoman, a wreath with leaves and one with flowers, a wire bowl, nesting dolls, a snowflake bunting and an owl one, and a kitty doorstop. The bedroom section includes patterns for a filet crochet afghan, felted bowls, a snowflake rug, a pinwheel baby blanket, tissue box cozy, chevron bedspread, and a bolster. The kitchen section includes patterns for dishcloths, blooming pot holders, watermelon coasters, table runner, overstuffed seat cushions, blooming tea cozy, flower trivets, pinwheel scrubbies, Tunisian pan handlers, and a cake/pie plate in the shape of a pie. If you have trouble choosing colors or are afraid of using color, each pattern has tips on choosing and using colors that will help you as you make your choices. Try tried and true color combinations or go out on a limb! My favorite projects in this book are the wire bowl, owl bunting, kitty doorstop/toy, snowflake doily rug, square dishcloths, blooming pot holders, and watermelon coasters. Plenty to keep me busy for a while.